There are multiple ways for women to consume beauty content. From text to image to video, women can easily discover digital content that helps them identify beauty trends, learn tricks of the trade, and discover which products are best for them. 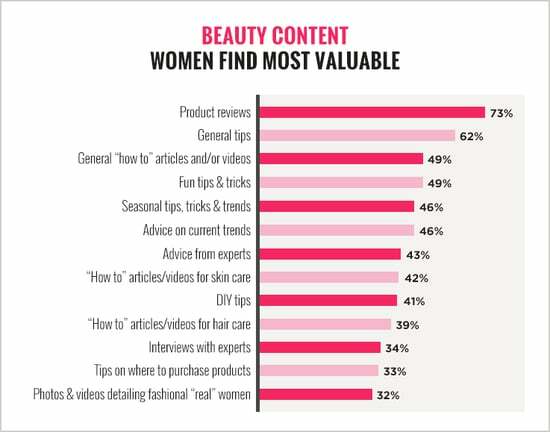 As part of the POPSUGAR Insights Q2 2014 beauty study, we asked women to share which source of beauty content they consider to be the most valuable. Perhaps surprisingly, women find product reviews to be the most valuable source of digital content. Seventy-three percent of women said that product reviews are most valuable, followed by general tips (62%). There's a fairly large drop from the top-ranked sources of content and their next tier, and less than half of women find general how-to articles or videos (49%) and fun tips and tricks (49%) to be valuable. Advice on current trends (46%) and advice from experts (46%) rank above DIY tips (41%) in terms of value for women. Women seek out information about what to buy and prefer general tips to event- and celebrity-driven info. Women were less interested overall in advice on which products to use for specific events (23%) and photos and videos that detail celebrity style (17%). Therefore, marketers should rely less on celebrity-driven beauty tips and instead focus on ways to help women decide the right products for them and offer general tips for everyday use.